Tumi's Bike Shop is a gathering place for local cyclists. While here, we were fortunate enough to be introduced to Peter Joel, an American who had spent many years in Australia, and now lives in Lesotho. He’s a business consultant by trade but spends a considerable amount of time helping out where he can. And he offered to help Tumi. We think this turn of events was extremely serendipitous and we’re gracious for the help. Regardless of the time we can put into advising Tumi from California, regular face to face communication and mentoring has a massive impact. With his accounts settled, Tumi will receive one more order on credit before he’ll need to start paying upon delivery. Peter has been tasked with helping Tumi develop systems and discipline that will ensure this happens. Tumi’s wife, Mamonyane, handles the bookkeeping, so Peter can also advise her on proper procedures and structure as well. One thing was clear on this trip - Tumi’s energy and passion for growing cycling in Lesotho is incredible. He has built a foundation for the sport to thrive. Whether it’s working with the government to build a BMX track for kids, supporting the racing scene in both mountain and road, or growing his business to be able to fuel this growth, cycling in this country is ready to explode. The Kingdom of Lesotho owes a heartfelt thanks to Tumi for everything he’s done. But now it’s time for him to focus on only a couple things, and let others take what he has built and continue to grow them. It was amazing to able to relate our own experience in growing Mike’s Bikes and what we’ve learned along the way. Tumi seems to truly understand what we advised him to do, and we're excited to see the outcome of his renewed focus. Add in Peter’s assistance, and the future is bright for Tumi’s Bike Shop and cycling in Lesotho. The future of cycling in Lesotho looks bright. 94 bikes distributed in one day, and a visit from the Minister of Sports. Another local school gathers for bike donation event. 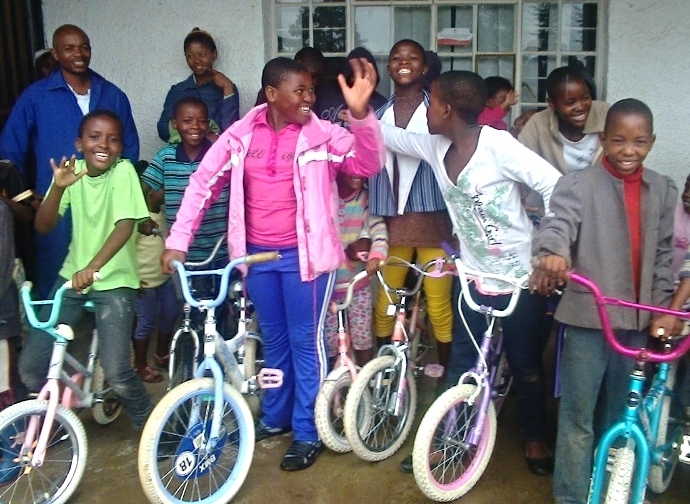 Today's donation in Lesotho of the now-famous Jeff and Dave bikes was to small students at a local school, along with the dolls hand sewn by ladies in Chicago. Also, we received through Tumi last week a letter from a school in town seeking donation of bikes for some vulnerable students there to use for transport to school. Tumi of course obliged, and invited the kids to the shop to receive their new bikes. One of the bike donations requested by a local school for vulnerable students to use for transport. Today's donation was a wet one. Today's Lesotho bike donation was to 20 needy students from Cenez High School. These students are orphans who endure an extremely long walt to and from school each day. We've seen the morning school rush first hand in Africa, and it's quite a sight. Hundreds of kids, all in uniform, some of whom have been literally been walking for hours, all arriving to school at the same time. What a perfect problem to solve with bikes! Today's donation unfortunately happened during a torrential downpour, but the students (and Tumi) didn't seem to mind one bit. Tumi noticed this lady and her kids near the bike shop and reached out to them with donated bikes. Needless to say, they're stoked! Bike donations now reaching into the mountains. The donated bikes from Jeff and Dave's second container into Lesotho is now reaching high into the rugged Moloti Mountains. This batch of 30 bikes was delivered to kids in Quthing Dele Dele, about 120km outside of Maseru. It was apparently quite the village event! The kiddie donation bikes are reaching into the villages. 25 bikes donated today at the Teyateyaneng Youth Resource Centre, 45km outside of Maseru. Today's bike delivery was in Haramoshabe village, about 60km outside of Maseru. On the way, Tumi noticed 3 kids walking to the local shop to buy achar (african salad) for their parents. He surprised them with a new bike and I think it's safe to say it made their day. Upon reaching Haramoshabe primary school with his trailer full of donated bikes, the kids welcomed Tumi "with great voices and big smiles". Check out these incredible pictures taken by the Pedaling Nowhere folks on their bike journey across Lesotho. Another batch of bikes delivered by Tumi. 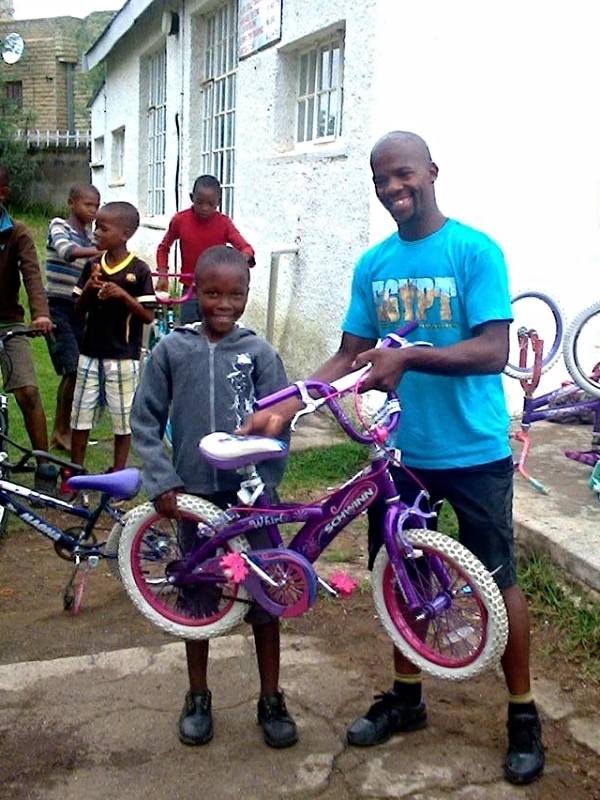 Today's distribution of bikes from the Jeff and Dave project was at the Scripture Union Center in Lesotho. At this event in the capital of Maseru, needy kids and orphans were called from their schools to this central meeting place where Tumi presented them with 20 donated bikes. 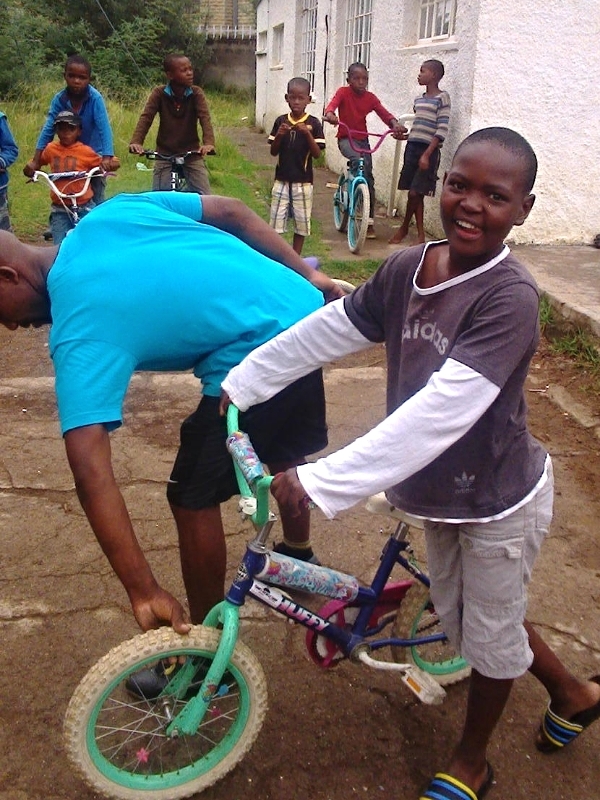 20 more young lives changed for the better with bikes in Africa! Our friends Jeff and Dave from Chicago have raised enough funds to cover transport and distribution of their 2nd container of bikes to Lesotho's orphans and other children in need. These 600 bikes were donated by our customers here in NorCal, and will be distributed by Tumi to the areas around the capital city of Maseru. The arrival of a container of used bikes in Africa is always an event, and this, our 24th shipment, was no different. Many people turned out to help, and the local news crew even showed up. Tumi has become known all around his country as "the bike guy", and this coverage will definitely help him further the cycling cause in Lesotho. Stay tuned for more info as the bikes get refurbished and Tumi and helpers from the Lesotho Cycling Association ramp up the distribution. Thank You to Kiwanis International Magazine for the showcase article in their Jan/Feb 2014 issue, and Thank You to the Lombard (IL) Kiwanis Club for their super generous $8000 grant, which will cover the ocean freight of Jeff and Dave's 2nd full container of donated bikes to orphans in Lesotho. Click here to link to the Kiwanis Magazine article. Just received the latest report from Tumi, along with some new pictures. When he has proper supply of bikes, Tumi's business is absolutely cooking. But between container arrivals, the shortage of bikes really puts a strain on the operation. Overall, the business is healthy and continues to employ Tumi, his wife, his mother, and two mechanics. Please help us spread the word about the Africa Bike Drive - keeping up with the demand for bikes in Africa continues to be a challenge. This customer of Tumi's is using his bike to transport a very heavy bag of maize. Tumi visits regularly with his competition across town. This shop just popped up last year, and to see that demand is so great that the community can support a second bike shop is a validation of all the hard work that's gone into developing a bike culture in Maseru.